Thursday night’s NBA Playoff action had a lot to live up to after Wednesday’s action. Despite a monster night by LeBron James, the Pacers nearly took down the Cavaliers. Oklahoma City’s Big Three flopped as Donovan Mitchell led Utah to a much-needed win. Even though James Harden struggled with his shot, the Rockets still dominated the Timberwolves. It was a lot to live up to, but Thursday night’s slate certainly didn’t disappoint. Joel Embiid and 76ers fans got their wish Thursday night against the Miami Heat—Embiid played. He made it pretty clear he wanted to after the team lost Game Two in Philadelphia the other night. But the team wanted to be cautious (surprise, right?). 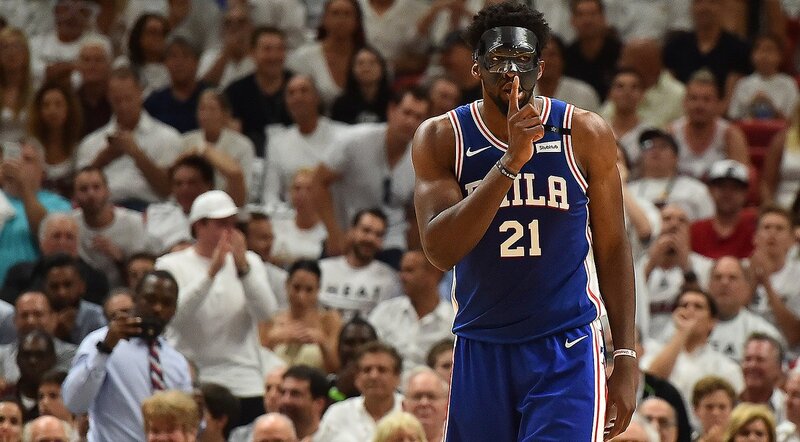 They did upgrade his status to probable earlier in the day, but then he ended up playing with a dark mask on his face to protect his recently repaired orbital bone. While it wasn’t necessarily a stellar night for “the Process,” it was good enough. He scored 23 points and pulled down seven rebounds in the team’s 128-108 win over the Heat. Yes, he found the mask a little annoying. The game remained relatively close for the majority of the contest. Philadelphia held a four-point lead after the first, 37-33. But the Heat held a one-point lead heading into halftime, 64-63. The 76ers retook the lead by the end of the third, but the game was still close, 96-94. That was when the game got out of hand. A quick 9-1 run at the start of the fourth quarter extended the 76ers lead to ten points, 105-95, with more than nine minutes left to play. But the 76ers never looked back. Miami got within five points, but when the Heat made their final basket of the game at the 3:24 mark, they were down by 11 119-108. Philadelphia ended up outscoring Miami 32-14 in the fourth to make the final score 128-108. The 76ers now hold a 2-1 advantage in the series. Game Four will be Saturday night in Miami. 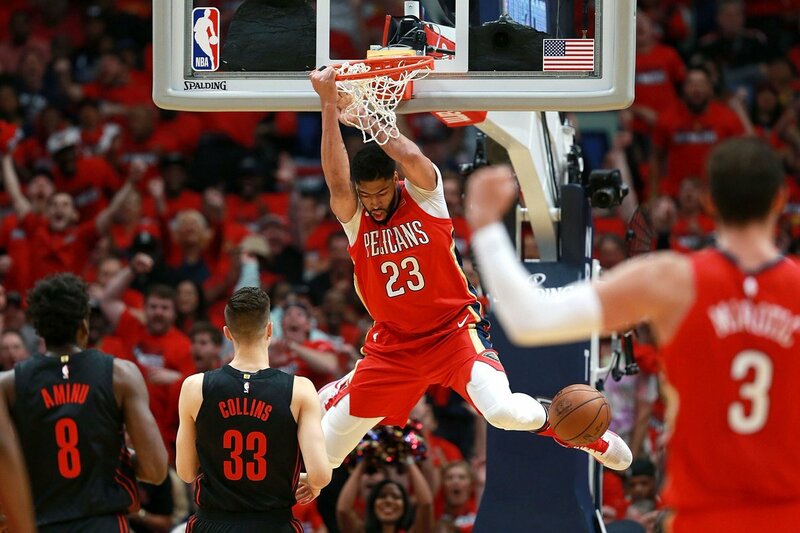 After losing both games at home, the Portland Trail Blazers were in desperate need of a win when their series with the Pelicans moved to New Orleans Thursday night. Since the first two games were close (two and nine points), it was not hard to imagine the Trail Blazers stealing a win in the Big Easy. But Nikola Mirotic and Anthony Davis had a different outcome in mind. The New Orleans offense, led by Mirotic, helped the Pelicans jump out to a 36-20 lead after the first quarter. From that point on, the Pelicans never really looked back. Portland got within 11 during the second quarter, but the Pelicans took a 19-point advantage into the half, 64-45. The second half wasn’t any better for the Trail Blazers. They fell behind by as much as 25 points during the third but managed to get within 21-points heading into the fourth. Playing against reserves for much of the fourth, Portland was able to close the gap a little. But in the end, they were still blown out, 119-102. Mirotic had an incredible night from the floor hitting 12 of 15 shots for a team-leading 30 points on the night. Davis chipped in with a double-double (28 points and 11 rebounds) while Jrue Holiday and Rajon Rondo each had 16. C.J McCollum led the Trail Blazers with 22 points. Al-Farouq Aminu added 21, and Damian Lillard chipped in 20 points. New Orleans will try to complete the sweep when they face off with the Trail Blazers in Game Four on Saturday. It was not surprising that the Spurs played without head coach Gregg Popovich Thursday night in the wake of his wife’s death Wednesday. He and Erin had been married for 42 years and had two children together. Ettore Messina coached the team in his place. Fans likely expected there would be some sort of memorial or moment of silence for Erin Popovich prior to the game. But while he wasn’t going to be with the team, Popovich was still thinking about them. Rather than make the game about him and his wife, he wanted the team to focus on the game instead. San Antonio gave the Warriors a decent fight, but the outcome was pretty much what it was expected to be. The Warriors held a 26-23 lead after the first and extended it to six points by halftime, 52-46. The Spurs got within two points early in the third only to be down by 12 points entering the fourth quarter. 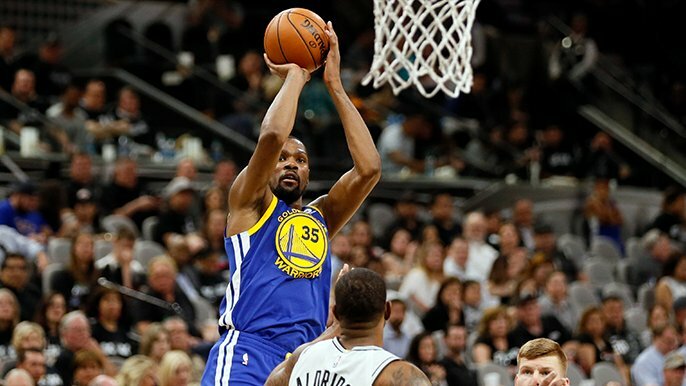 Golden State coasted through the fourth period before wrapping up a 13-point win, 110-97. While they are now within a game of sweeping the Spurs, the Warriors didn’t walk away unscathed. Kevin Durant and Shaun Livingstone both left the game in the fourth with ankle injuries. Durant walked off under his own power, and Livingstone shot his free throws before leaving the game. The Warriors can finish the series off with a win in Game Four Sunday in San Antonio.